If you have ever wondered where the crabgrass in your lawn comes from each year, the answer is that it germinates from its own seeds every spring that are left from the year before. They are also brought to your lawn from the wind, your neighbors properties, birds, your landscapers mower equipment etc. The crabgrass seeds that germinate in the lawn this spring came from what was produced in the fall of last year. 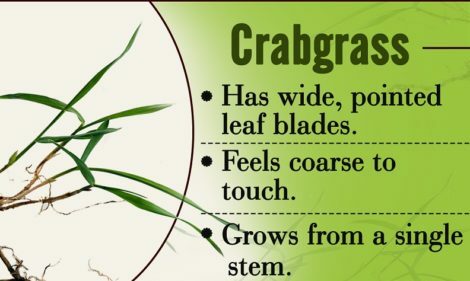 Crabgrass is a summer annual plant which means that it germinates from its seeds each spring. It then grows larger as the weather warms up, produces another cycle of seeds in late summer and is killed by the frost in the fall. If you have crabgrass in your lawn or crabgrass scars from last year, you need to take early steps to control it again this year. 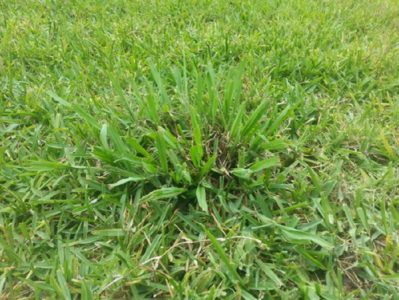 The most effective way to control crabgrass is to prevent the crabgrass seeds from becoming established in your lawn in the first place, by applying a pre emergent herbicide. A pre emergent herbicide forms a solid herbicide barrier at the top surface layer of the soil. As the crabgrass seed germinates, the emerging root contacts the herbicide barrier and is blocked. The pre emergent herbicide disrupts normal root growth and the crabgrass seedling is eradicated without ever Germinating. Pre emergence herbicides must be applied BEFORE the crabgrass seeds germinate. The pre emergence herbicides must be there in the soil as the crabgrass seeds germinate so the new germinating root will come in contact with the herbicide. 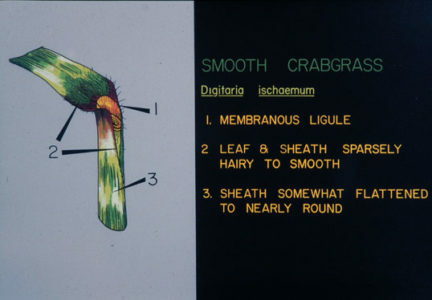 The crabgrass seeds begin germinating as soon as the soil temperatures at a three inch depth reaches 51° to 56° F for at least several consecutive days in a row. The date at which crabgrass seeds germinate always begins depending on your geographic location. Crabgrass seed germination occurs in northern locations like here in Long Island in late spring. 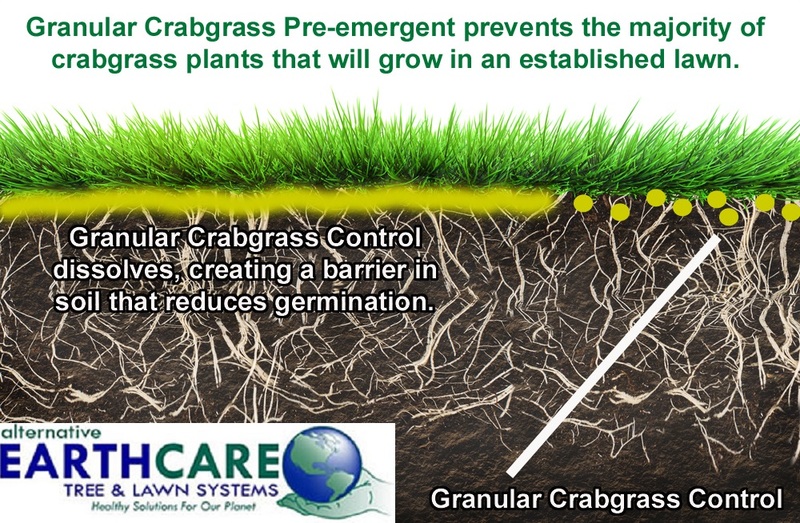 Our pre emergence crabgrass product application will control the germinating crabgrass seeds just the same as other pre emergence herbicides plus, it will control all the crabgrass plants that have germinated and are present at the time it is applied (usually up to three to four weeks after germination). A spring fertilizer formula WITH crabgrass prevention gives you much greater calender flexibility on the date windows when we can come and do the product application, increasing success rates. Normally if you miss the date of crabgrass seed germination it will not control the tiny crabgrass plants that have already begun to grow plus any crabgrass seeds that has not yet germinated. Our fertilizer in the product will make the lawn green up really nicely, as well as grow. The fertilizer is also designed to encourage the existing turf grass plant to fill in all the bare and thin areas resulting in a much greener, thicker, better lawn. This increase in turf density will also have the residual effect of helping the turf grass plants crowd out all the other crabgrass. 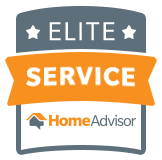 There is always confusion on whether crabgrass lawn care applications should be applied to a dry or wet lawn. Our spring fertilizer with Crabgrass formula is applied to a dry lawn, but it is important that you water, or it rains after applying the pre emergent herbicide and fertilizer combination product. By watering right after we apply the pre emergent herbicide that will insure that the product will be moved off the leaves and down to the soil surface where it is effective. Watering immediately after our application is best. The sooner you water right after we have applied the product the better. Our product most certainly should be watered into the lawn within a 24 hour time frame after application. It is important to remember that timing is everything for all lawn weed problems and our applications. Our staff will always make sure that all of our crabgrass and fertilizer applications are done at the right time.